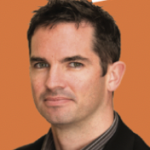 While most multi-unit developments in Ireland have a sinking fund, SCSI research has discovered that most are inadequate. 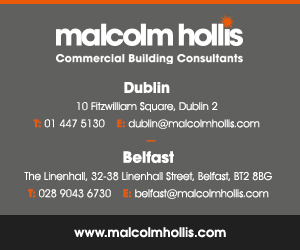 Widespread apartment living is relatively new in Ireland but is growing rapidly. Apartment numbers rose by 85% between 2002 and 2016. The housing crisis and continuing urbanisation mean that the trend will continue. The growth of multi-unit developments (MUDs) has seen the emergence of owners’ management companies (OMCs) to manage them. Developments are usually managed on a day-to- day basis by professional managing agents, many of them SCSI Chartered Property Managers. An MUD needs a good sinking fund to ensure that it has the resources to refurbish its common areas and upgrade lifts, roofs, fire safety systems, carpets, etc. Inadequate sinking funds reduce the quality of the property and potentially compromise health and safety. As the seanfhocal says: “An té nach gcuireann san earrach, ní bhaineann sé san fhómhar” (“If you do not sow in spring, you will not reap in autumn”). 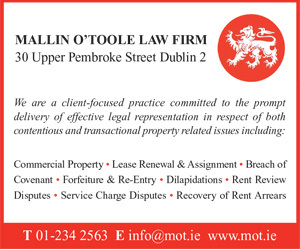 The 2011 Multi-Unit Developments Act requires that MUDs set up a sinking fund and mentions a guideline annual contribution of €200 per property. As MuDs differ widely, this is a purely notional figure. For a specific MUD, the OMC should ask a building professional to prepare a long-term building investment fund (BIF) report. Education is needed to help property owners understand why good sinking funds are in their interest. The SCSI recently published a report on sinking funds in MUDs. 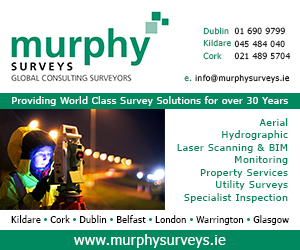 This drew on consultations with nine large Irish managing agencies, with data covering 632 MUDs and 52,600 properties. 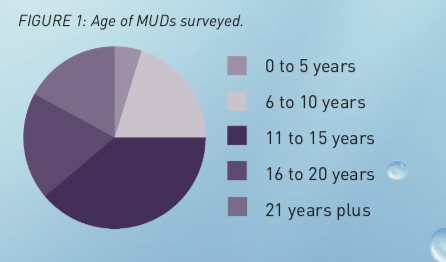 The age profile of MUDs in the study (Figure 1) suggests that the issue of inadequate sinking funds will come sharply into focus in the decade ahead. A positive finding was that almost all MUDs covered by the study have established a sinking fund. If developments have inadequate funds and need to undertake works, a special levy for members is often required. In all, 77% of agents said that less than one-quarter of MUDs under their management have adequate sinking funds. When asked why so many MUDs have inadequate sinking funds, agents said that many property owners do not want higher charges. 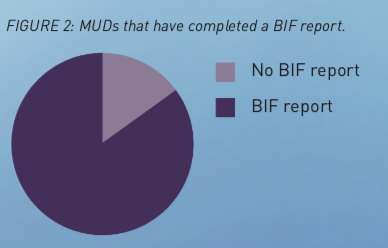 Related to this is the finding that six out of seven MUDs do not have a BIF report (Figure 2) and so do not know how much funding they will require in the future. Of those that have prepared a BIF report, only a minority are fully implementing its findings. 1. One reason OMCs find it hard to build sinking funds is the challenge of collecting service charges from owners who refuse to pay them. Changes to streamline the collection of service charges would assist all OMCs. 2. Regulation should be developed to support good practice on sinking funds. 3. Any update of the Act should require that a sinking fund be established from year one. 4. As many elements of MUDs are reasonably standard, a guide on standard ‘wasting assets’ in an MuD should be prepared. 5. The Government should consider ways to incentivise OMCs to put money aside. 6. It is likely that some MUDs will face funding shortfalls for essential projects. The Government needs to consider if they will support such MUDs financially and in what circumstances. 1. Safety files passed to OMCs by developers should include information on the lifespan of materials and associated recommended maintenance. 2. A BIF report should be prepared at the outset and provided to the OMC by the developer. 3. Sinking fund contributions should be included in annual charges from the outset. 4. A small proportion of the purchase price of properties should be allocated to the sinking fund. 1. Education is needed to help property owners understand why good sinking funds are in their interest. 2. Estate agents should supply information on sinking funds and whether a BIF report has been prepared. 1. 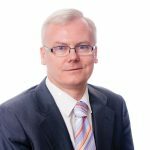 The Law Society of Ireland should check if pre-contract enquiries can include more on the sinking fund and whether a BIF report has been commissioned. 2. Local authorities and social housing associations that own or rent properties in MUDs should support the preparation of BIF reports and strong sinking funds. The need for good sinking funds in MUDs is no different to the need for any home owner to put money aside in a prudent way for long-run refurbishments. However, OMC requirements mean that building a sinking fund must be co-ordinated across many owners and the detail of the buildings is more complex. Supporting OMCs to have good sinking funds will support apartment living in Ireland as a normal, long-term residential choice. The majority of building investment fund (BIF) reports that I undertake are of 10- to 15-year-old developments. upon completion and meeting with OMC directors, there can be disbelief regarding the costs in the report. These costs are arrived at by identifying a material type, its expected lifespan, current remaining lifespan, the area and rate for replacement. Design and material selection of a building is critical to the life cycle costing of the development. When I arrive at a development and see a slate roof, uPVC windows and brickwork walls, the BIF numbers will generally be low due to their long life and low maintenance specification. By contrast, if I see flat roofs, timber windows and painted render, I know that ongoing maintenance costs and short lifespan will require higher sinking fund contributions. BIF reports should be prepared at the outset of the development so that purchasers are aware how much an apartment will cost initially and over the following decades. I believe this requirement should be put on a statutory footing. It should be remembered that the BIF report is a living document, which can be used by the property manager to identify necessary works each year. It is also an evolving document that needs to be updated periodically to identify advanced deterioration of some elements, which may bring their replacement dates forward. Read the full SCSI report ‘Sinking Funds in apartments: Meeting the Challenge’ at www.scsi.ie/resources/pdf/2018/sinking_funds_in_apartments_2018.